Today at the Paris Motor Show, Toyota announced it has reached an agreement with Microsoft to collaborate in the 2017 FIA World Rally Championship (WRC) series. 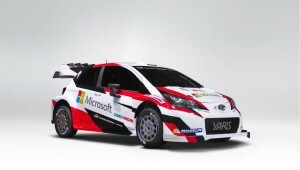 As part of the agreement, Microsoft will serve as a “technology partner” for the TOYOTA GAZOO Racing WRC rally team. Using Microsoft technology, Toyota wants to maximize its competitiveness in WRC, whilst ensuring that learnings from the race course can be used to achieve the company’s vision of designing and manufacturing “ever-better cars”. Toyota understands the important role that information technology must play in order to further accelerate the development of the automotive industry. Gathering valuable data will help lay the foundation for the future of sustainable mobility. This, in turn, will help create a society in which everyone can live at ease, safely and freely. Another important contributor to a safer automotive future is the Toyota Research Institute1 (TRI), which is focused on artificial intelligence for automobiles, robotics and scientific discovery. TRI is bringing to life Toyota’s vision of autonomous driving, which follows a double approach. The first type of application is ‘Chauffeur Mode’, where the car is fully autonomous. It has the potential to offer mobility to those who would not otherwise have it, such as older people and those with special needs. In order to accomplish this safely, it isestimated that some 14.2 billion kilometres2 of testing, including simulation, are required. Microsoft is an important partner in the test-mile accumulation, since a lot of the work can be done through multi-agent simulation.